During the first two weeks of December in Kennebunkport, Maine people visit from all over for their Christmas Prelude Celebration. Earlier this year we heard locals talk about the event and decided that this was time to check it out. For you shopaholics all the stores in town are open as well as a number of craft fairs. But more than that it is a place you can go to really get into the spirit of the season. You will find warm friendly smiles everywhere you look and decorations throughout the town. We originally planned to go on Saturday but the pouring rain forced us to wait until Sunday. While the sun returned so did the freezing cold temperatures. 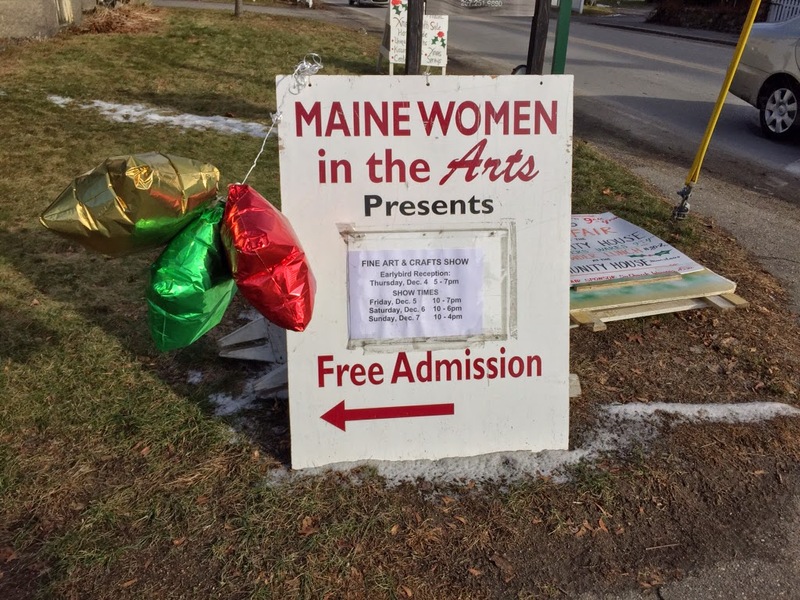 When we arrived into town we couldn’t find a parking space in the main lot in downtown so I dropped my wife off and we agreed to meet up at the Maine Women in the Arts Fine Arts & Craft Show. When I got back to the area I went to a building that was right next to the sign that I thought was the craft show. I walked by a women out front who was selling wreaths and she said "hello" "This must be it" I thought. I went straight through the front door and asked if this was the location of the craft fair. The women inside looked at me with a resounding "No" and I quickly turned around and high tailed it out of there. I thought it was strange that there was a bed and a refrigerator inside and that's when I realized that I was in the wrong place. As I walked away the woman out front said "I thought you knew the owner". Having embarrassed myself, I called my wife and she directed me to the correct location and I was greeted by her hysterical laughter. Okay, so the sign was a little deceiving. It could have happened too anyone I told myself. We enjoyed looking at the unique items and we had a nice chat with some of the ladies from the show. I told them the story of walking into that poor woman’s home. We all had a good belly laugh about that one and we were on our way. 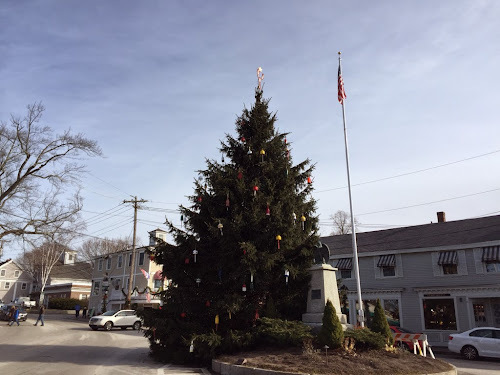 Continuing down the road in the middle of town was a beautiful tree decorated with a nautical theme. Notice the lobster on top and the buoys all over. After stopping at some of the stores, we decided that we had enough of the biting cold wind and decided to jump in the car and drive to some of the other craft fairs that aren't so close to downtown. One of those was at the conservation center. Looking small from the outside we were wondering if there would be anything worthwhile inside. They have two floors with crafters and plenty of free goodies to munch on while you are walking around. 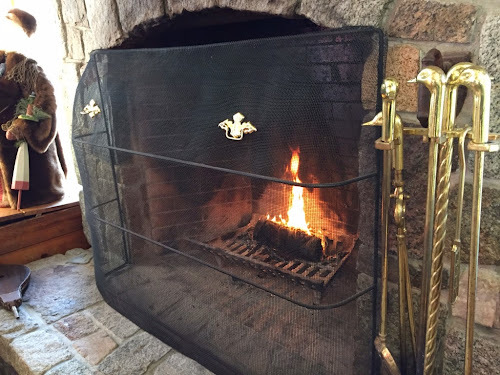 You might also enjoy siting near the fire as I did. We also checked the one out at the American Legion and decided to go back down town to walk around some more. After we looked through the list of events one of them that I wanted to see was Santa and his lobster elves arriving on a lobster boat. Everyone lined up on the bridge and surrounding area and then the time arrived for the Ocean St. Nick and his Merry Lobster Elves. 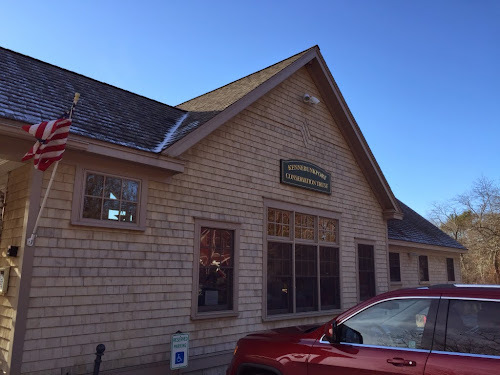 Kennebunkport is wonderful to visit any time of year but if you are looking for something to get you in the holiday spirit then a road trip to Christmas Prelude is in order. Restaurants are usually mobbed so be sure and make a reservation early if you can. There are plenty of decent options but we do recommend David's and On The Marsh. Don't forget to reserve a room well in advance if you are staying over because the rooms fill up fast. This year Christmas Prelude runs in Kennebunkport until Sunday, December 13th. Here is a list of the events and remember that it is never too early to start planning for next year.